The Puerto Princesa Subterranean River National Park ( Also previously known as the St. Paul subteranean river) is a UNESCO World Heritage Site located about 50 kilometers north of the city of Puerto Princesa in the province of Palawan, Philippines. 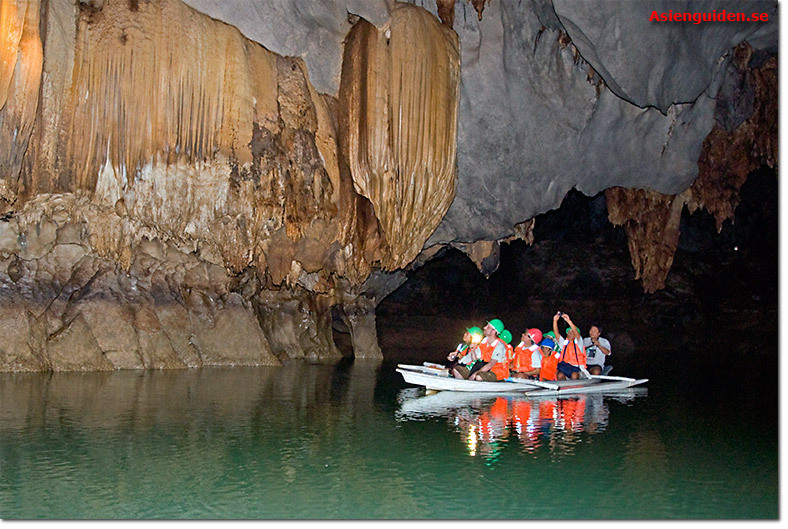 It contains the renowned Subterranean River, thought to be the longest navigable underground river system in the world. The National Park is part of the Saint Paul Mountain Range situated on the northern coast of the island. 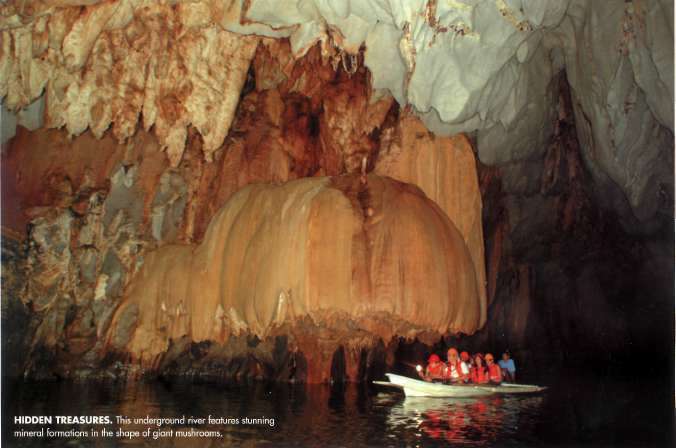 The Puerto Princesa Subterranean River National Park features a limestone karst mountain landscape with an 8.2 km. navigable underground river. 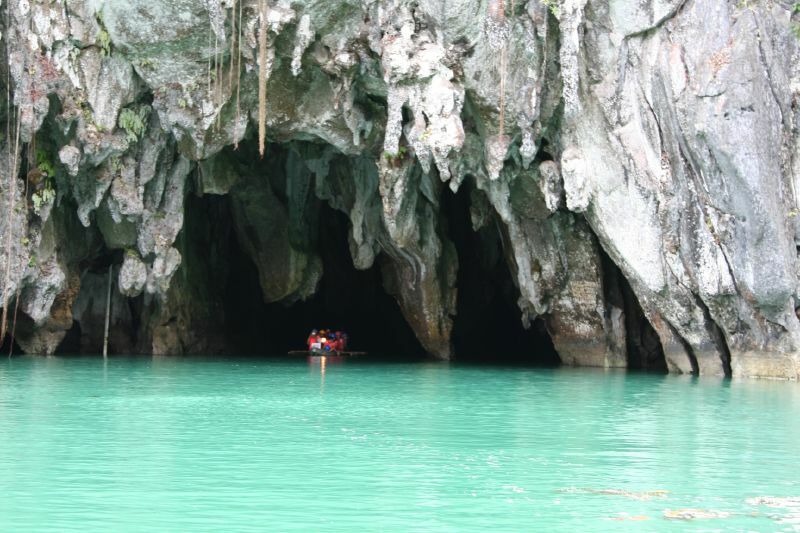 A distinguishing feature of the river is that it winds through a cave before flowing directly into the South China Sea. 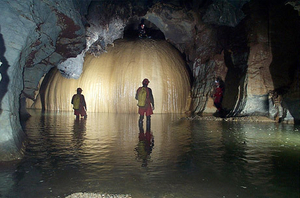 It includes major formations of stalactites and stalagmites, and several large chambers. The lower portion of the river is subject to tidal influences. The underground river is reputed to be the world's longest. The area also represents a significant habitat for biodiversity conservation. The site contains a full mountain-to-the-sea ecosystem and has some of the most important forests in Asia. Because of its natural wonders, the Puerto Princesa Subterranean River National Park is a key destination for local and international tourists alike. 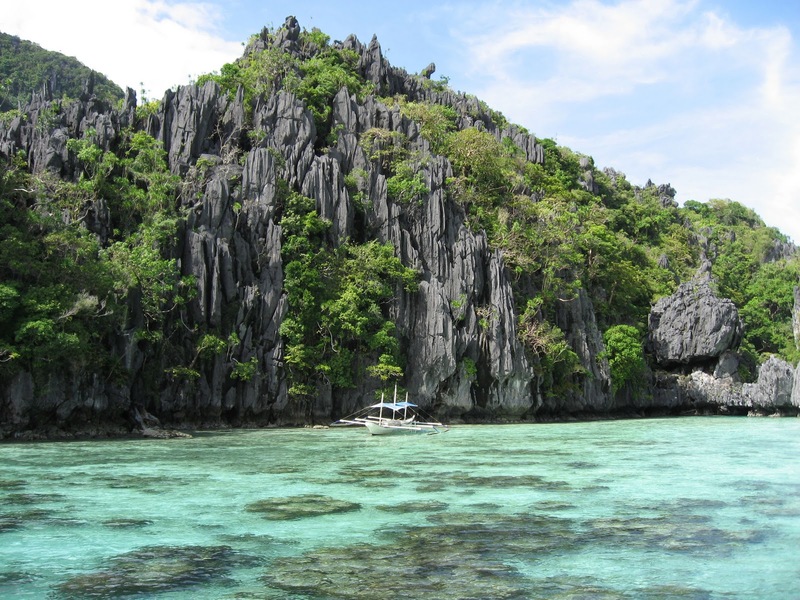 According to the Palawan Council for Sustainable Development website, the park gets an annual income of about Php 5 million. This finances the maintenance, managed by the Protected Areas Management Board (PAMB) headed by the City Government of Puerto Princesa. In order to get to the National Park, you must take the Puerto-Roxas road which goes all the way to Sabang, where the park is located. There are also daily buses which leave Puerto Princesa's San Jose bus terminal at 7am, and fare costs are at around Php 300. Two or three jeepneys also take the same route, leaving the terminal at the same time, but are cheaper at Php 200. Trips take three hours. To explore the Subterranean River, one must secure a permit at the Tourist Information and Assistance Center at the Sabang pier. This costs Php 150 for Filipinos and Php 200 for foreigners. The office can also arrange boat transport to the river (round trip P700, 15 minutes). Then after a five minute walk to the actual entrance, you will be given a lifejacket and helmet, and assigned a boat and driver for the trip to the cave. The boat ride takes you inside the cave for only about 5 kilometers, since beyond this the river becomes difficult to navigate. The round trip takes about 45 minutes. Cameras are allowed. The PPSRNP was established on March 26, 1971, by virtue of Presidential Proclamation No. 835 issued by the late President Ferdinand E. Marcos. Formerly known as the St. Paul Subterranean National Park, it initially comprised of 3,901 hectares of terrestrial reservation. To ensure long-term viability, former President Joseph E. Estrada signed Proclamation No. 212 on November 16, 1999 expanding the area of the Park to 22,202 hectares that now includes the entire catchment for the Underground River and significant forest important for biodiversity conservation. It was also renamed to Puerto Princesa Subterranean River National Park to properly identifying it with the place. The PPSRNP was also declared as a National Geological Monument on December 11, 2003 by the National Committee on Geological Sciences (NCGS).